I finished playing this game and I feel I really need to comment. First, I am absolutely amazed at the adaptation of the old "escape the room" theme. The story really draws the player in. Next is the puzzles themselves. The difficulty is exactly in that sweet spot where the game progresses so long as you keep plugging away at it without the puzzles getting frustrating. What a wonderful combination of traditional puzzles with a lot of fresh and surprising material. It goes without saying that the stunning graphics just puts that overall polish on the game that makes the entire experience memorable. The only thing you might want to add if you have the time is that some actions cause the screen to go dark and then come back and the action is completed. I know that it's a lot easier to imply the action rather than put in the animation but it might be a nice touch if you put in the appropriate animation. Otherwise, a very impressive job. I look forward to more games from the authors. I'm really happy that you enjoyed playing it. About the "fade to black" actions : yes... that's exactly what you said... animations are difficult and take so much time to be done that we used this simple "trick". Maybe we'll do a deluxe version with more animations if we have time! [hide]The "key falling out of the keyhole" part can be done repeatedly to achieve this. But apart from that I finally did it. Very cool game! The graphics are superb for an amateur project. Especially the final escape scene looked amazing! Clever puzzles, nice story idea. All in all a job very well done! Now go and make more of this with your brother! Now go and make more of this with your brother! and so I also just happend to record a fast playthrough through the game with hopefully all look at explanations and lots of intersting interactions. !!! ALL SPOILERS IN THIS LONGPLAY VIDEO !!! !!! THIS VIDEO IS ALL SPOILERS !!! I made that mistake as well. I even went so far as lassoing from atop the bridge. I made that mistake as well. Based on your feedback, I changed this in the last version yersterday : USE and THROW can be both used with this item now. I didn't want the player to be stuck like this just because of a "bad" choice in the verbs whereas the logic was correct. I kept the THROW verb-only for the dynamite because it seems more logic with this item. I even went so far as lassoing from atop the bridge. Congrats on the release, team! so I am glad you changed that now). Congrats for releasing such an entertaining and well done little game. I really like the graphics and gameplay! Awesome short game, got me stumped a few times! The art was astounding, and the animations were smooth, even if there weren't many (I did not notice the ol' fade to black trick was used a few times!). "The two-word phrase one’s self is only justifiable when self is used in a spiritual, philosophical, or psychological sense. In all other cases, one’s self can be replaced with the pronoun oneself." "Both one's self and oneself are correct. Most people would use oneself, whereas deep thinkers would use one's self." I finally got to play this one! In all, very nice game! You get percents for trying everything, even if it doesn't work out. [hide]The door can not be opened. I finally got around to finishing this after geting quite stuck. One thing that impresses me about this game is the use of space and the 3D-like depth of the room. Nearly all AGS games have that basic box-shape (or variants of it). I sometimes think that it's a waste of time to make up and down walking animations (let alone diagonals) when most games pretty much just have the character move left and right 90 percent of the time anyway. But in this game I really felt that I had this big space to explore. The other thing that impressed me was the ending. I did have one complaint about the game (that the puzzles are a bit mundane) but actually the ending kind of explains why those particular kinds of puzzles were chosen, so it was worth slogging through them to get the finale. What? The puzzles are mundane? Yes, I get that... they certainly are... I think it's because it all started as a proof of concept for us. The story came after, in order to create a context for the "mechanics" we would like to test... We didn't aim fo originality, that's true Maybe next time? But glad to see you like it anyway. 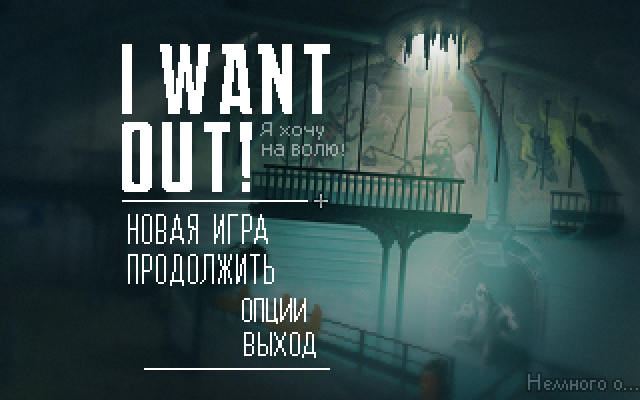 I'm happy to announce that I Want Out! is now available in German, in addition to English and French, thanks to ToxicTuba! 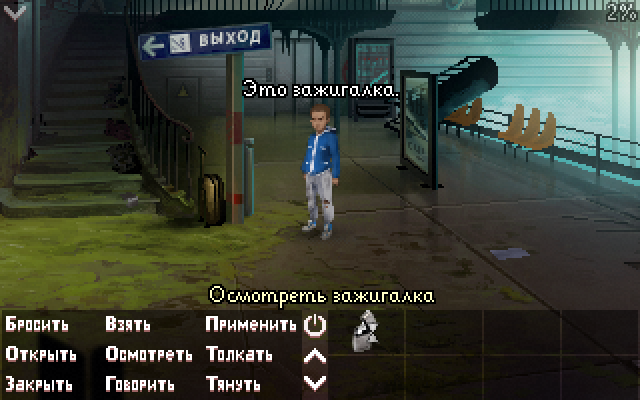 Thanks to Alexander Preymak and Windows-1251 encoding (sic), the game now exists in Russian! I know now that the game was trying to tell me (...) you idiot!" Thanks for your input, Mandle.